Last week, NetSuite conducted its annual user conference. The event itself was very well attended, full of positive energy and replete with numerous announcements of new functionality and other items of importance. The first major headline for me involved CEO Zach Nelson’s announcements regarding a new commerce suite. This collection of functionality is targeted for a large number of retailers, e-tailers and other merchants. Zach repeatedly made the case that a NetSuite solution would provide better integration, fewer interfaces, etc. than competitive solution that are often cobbled together from many disparate products. 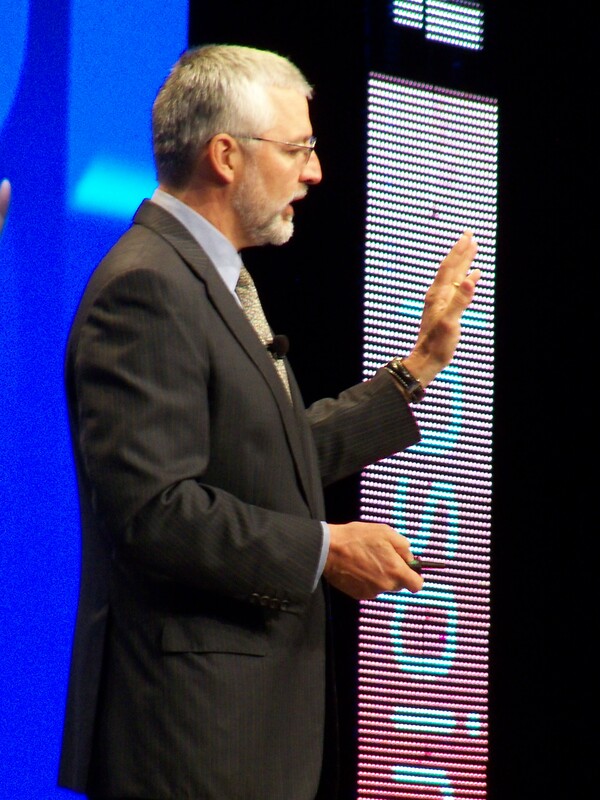 NetSuite CEO Zach Nelson – copyright 2012 TechVentive, Inc. While many people have or will write of the new commerce functionality, the solution should serve as a signpost for where NetSuite must take its product line in the very near future. Specifically, NetSuite’s large and growing core ERP product line currently maintains large volumes of transaction data for customers. While many of these records are accounting transaction days in nature, the ever expanding product line footprint includes many other ERP records involving inventory movement, product data and other information. 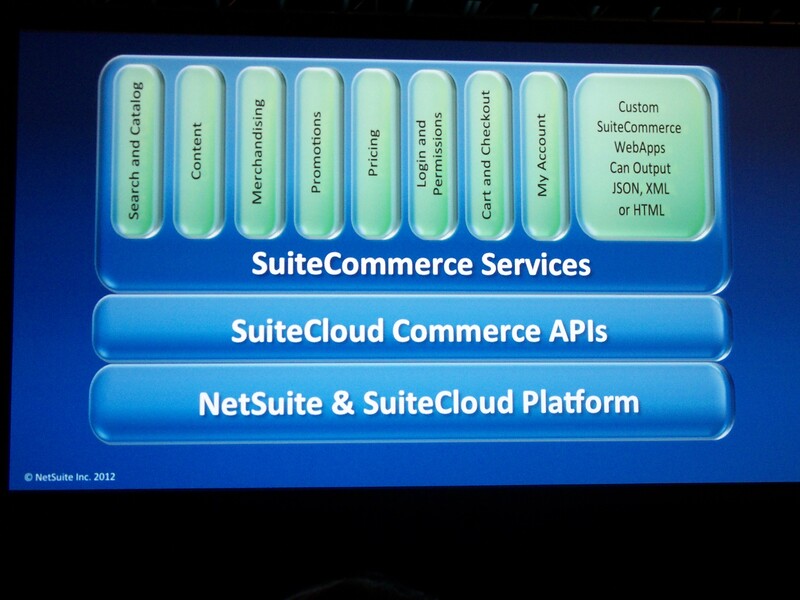 NetSuite Commerce engine – Copyright 2012 TechVentive, Inc. But as vast as this information within the ERP core product line is, it may pale in comparison to the volumes of transactions that can be generated by a robust commerce product line. Just imagine the quantity of individual order line items a large e-commerce retailer would generate. Imagine the volume of point-of-sale transactions possible from a large brick-and-mortar retailer. Imagine what sort of insights could be found within this data. It is this mass of information within the commerce and ERP systems that will present the next challenge or opportunity for NetSuite. Recently, I’ve spoken about the concept of a trifecta. Simply stated, when three or more related technologies come into being at the same time, they have the potential to create massively transformative changes on the business and consumer landscape. The most significant trifecta for the last several years has been that of social, mobile and cloud computing rolled together. This has clearly had a significant impact on the application software world and these three are now impacting virtually every process and workflow of modern businesses. This trifecta is redefining business and business systems today. In the last couple of years another trifecta has emerged. This one involves big data, analytics and in memory database technology. These three technologies excel when large amounts of internal and external data can be quickly crunched to produce new and economically beneficial insights for businesses. It is this second trifecta that was notably absent in the discussions by NetSuite executives. Their newest systems (and the volume of transactions these new systems will produce) will certainly try their customers. These customers will expect the new solutions will come with mechanizations to parse and make sense of the new data, external data and more. These are the opportunities and new capabilities within the second trifecta. During a press conference, I asked Zach Nelson exactly this question. He asked a customer to speak about how they are using the new insights and information within the NetSuite commerce products. We heard how this customer is using the information to calculate lifetime customer value for their firm. We also heard that partners, like MyDials or systems integrators, will need to create these advanced capabilities. Could weather data be added to the mix to help retailers forecast their staffing needs at brick-and-mortar locations? Could GDP and other economic data be used to better identify placement of retail locations, distribution centers, etc.? Should powerful algorithm/modeling/multivariate optimization technology be incorporated in the product line so that the effect of seasonality can be included in stocking, replenishment and pricing decisions? Can more powerful cost accounting modules be developed to take into account more precise costing nuances around cubic area of storage space required, detailed picking cost information, etc.? The announcements at the show were certainly very important in expanding NetSuite’s product footprint and providing direction into the verticals that NetSuite wishes to dominate. Whether NetSuite chooses to continue to provide the advanced business intelligence/analytic modeling that can take these solutions (and by extension the businesses that use these solutions) to greater market success, is the big question for the next year.